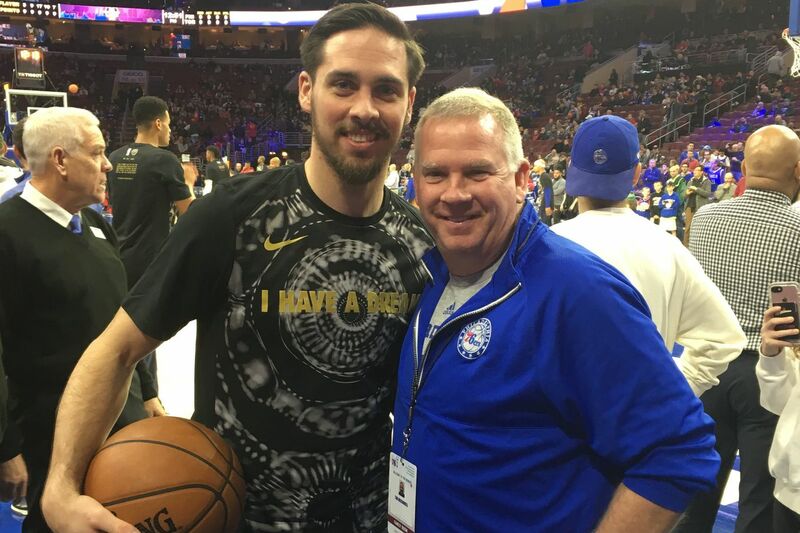 Tim McConnell, the father of 76ers point guard TJ McConnell, never wishes TJ luck before a game. That’s the message McConnell also instills in his players while coaching the Chartiers Valley High School girls’ basketball team. Located in Collier Township, Allegheny County, about eight miles southwest of Pittsburgh, they meet Archbishop Carroll in the PIAA Class 5A state championship game at Hershey’s Giant Center on Saturday at 6 p.m.
McConnell coached his two sons, TJ and Matty, at Chartiers Valley and stepped down last season after 25 years and a 552-146 record. He then applied for the girls’ position and now gets to coach his daughter, Megan, who is a 5-foot-7 junior guard for the Colts. According to MaxPreps, Megan averages 11.1 points, 4.4 assists, and 4.1 rebounds per game for the Colts, who go into the game against Carroll with a 29-0 record. Now that McConnell spends more time with his daughter, it has brought them closer together. Little did those fans know, their attention just added fuel to the fire. TJ McConnell scores between Golden State's Jonas Jerebko (left) and Kevin Durant earlier this month. “Knowing all three of my children the way I do, I absolutely love when they would do things like that because it just helps motivate my kids to prove people wrong,” Tim McConnell said. “That, to me, helped us more than hurt us." Now that TJ -- Timothy John -- is in the NBA, it’s hard for Tim to watch his son play in person or on TV because of his busy schedule. But Tim said that he bought the NBA package and tapes every game he can’t watch live on TV. Tim McConnell said he was initially surprised that TJ made an NBA roster. But he isn’t surprised that once TJ “got his foot in the door,” he would stick around for good. TJ McConnell (left) and his father/coach Tim McConnell during their high school days at Chartiers Valley High, near Pittsburgh. When TJ walked off the floor in his final game at the University of Arizona in 2015, he didn’t think the NBA was an option, and neither did Tim. The day it became realistic for the family was the day Tim got a phone call he’ll never forget. And now that TJ is in his fourth year with the Sixers, with one playoff appearance under his belt and on his way to another, Tim McConnell said he revels in the stories that TJ shares about some of the NBA’s biggest personalities.